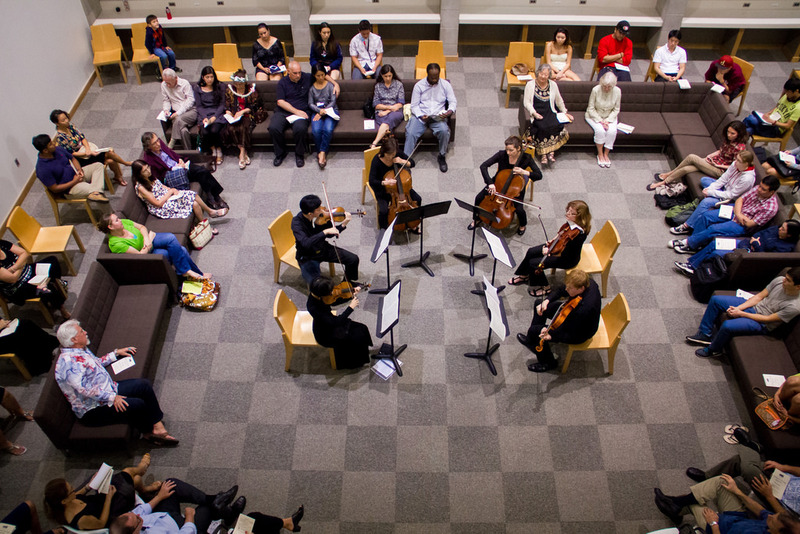 Chamber Music Hawaii Galliard String Quartet in concert at the UHWO Library. UPDATE as of 10/8/15: The ticket prices included in the original story have been updated to reflect the prices for the Chamber Music Hawaii 2015-2016 season. The University of Hawai‘i – West O‘ahu will be filled with the sounds of beautiful music as host to Chamber Music Hawaii’s concert series featuring the Spring Wind Quintet, Honolulu Brass Quintet and Galliard String Quartet this fall and in spring 2016. These Chamber Music Hawaii ensembles will perform a three-part concert series at the UH West Oʻahu Library that provides a marvelous acoustic setting for the evening performances. All ensemble members are full-time musicians with the Hawai‘i Symphony Orchestra (formerly the Honolulu Symphony). Open to all, the concerts are free for students with a valid student ID. Tuesday, Oct. 20, 7 p.m. There is nothing like the sound of a brass ensemble in December. The Honolulu Brass Quintet will bring holiday cheer to UH West Oʻahu with a popular selection of seasonal music. Purchase concert tickets online or call (808) 489-5038. Students must present a valid student ID at the concerts for free admission. Tickets are $30 per person. Discounted prices are available if purchasing tickets for all three UH West Oʻahu concerts. For more information about the Chamber Music Hawaii concerts at UH West Oʻahu, contact Dr. Jon Magnussen at jonmagnu@hawaii.edu. Tagged Chamber Music Hawaii, concert, Galliard String Quartet, Honolulu Brass Quintet, Jon Magnussen, library concert, music, Spring Wind Quintet. Bookmark the permalink.